Howard is the co-founder and former artistic director of Woolly Mammoth Theatre Company in Washington, DC,, and Carey is the former artistic director of American Conservatory Theater in San Francisco, CA. Howard Shalwitz: I was telling you before that I had my final day in the office yesterday, and you said your final day was just a little bit ago? Carey Perloff: Well, my last official day at ACT was 30 June, but as it happened, I was directing down at the La Jolla Playhouse, and so I flew back on the day off to clean out my office, which was really surreal and strange. I keep everything. I had twenty-five years of scripts and maquettes, and opening night cards and thousands of books. Then I went back and finished the show at La Jolla. And then we brought A Thousand Splendid Suns back to the Geary, kind of my last hurrah. We closed on a matinee on Sunday, and then we did a huge blowout party, and that was that. Howard: I had more time to clear out my office because I wasn’t working out of town at that point the way you were. I didn’t have to do quite that much juggling, but it turned out to be a busy summer. The original plan was that I would end 30 June as well, the same day as you, but I extended a little longer, two extra months. I think I chipped away at going through boxes and files that entire time, bit by bit, and I finally cleared out the last of it after I left the party last night. Carey: There must be such an incredible amount to archive about Woolly Mammoth and your whole history there. Did you find amazing things that you want to make sure you hold onto, write about, think about? Howard: Yeah. It’s interesting, in the midst of this process we got approached by a local university to house our archives, something we’d never thought about. So we’re going to probably work that out with them. And it made me think, “As an organization, we need some clearer protocols about this stuff.” In my case, I’m a founder, so I have files in my office that are from before anyone else has any memory of Woolly Mammoth. I think there’s a tendency for people coming into the field to feel that these regional theatre institutions, if you want to call them that—and I’m sure you hate that word as much as I do—have always been there. And you and I know they are ephemeral things that are always shifting. It didn’t exist at one point, and the time will come in the future when it doesn’t exist again. The stories seem important. Carey: That’s exactly right. I’d be fascinated to read the founding documents of Woolly Mammoth, which is such a unique place. I wrote a book a couple years ago called Beautiful Chaos: A Life in the Theater about my twenty years at ACT. I started writing it as a couple of articles about my insane and disastrous first year for American Theatre, and then just kept going. In doing that, I went back to all the founding documents of ACT. I had come to the organization when I was thirty-two, I had a three-year-old child, the institution was absolutely bankrupt—it was eighteen-hour days for ten years. I didn’t spend a lot of time researching and going through all the archives then, but when I finally did for the book, I read everything that Bill Ball had written, his manifestos about the early times of ACT. Howard: I haven’t read that stuff, but Bill’s A Sense of Direction is, to me, the best book on directing that’s ever been written. Howard: It’s the foundational book for my whole career. 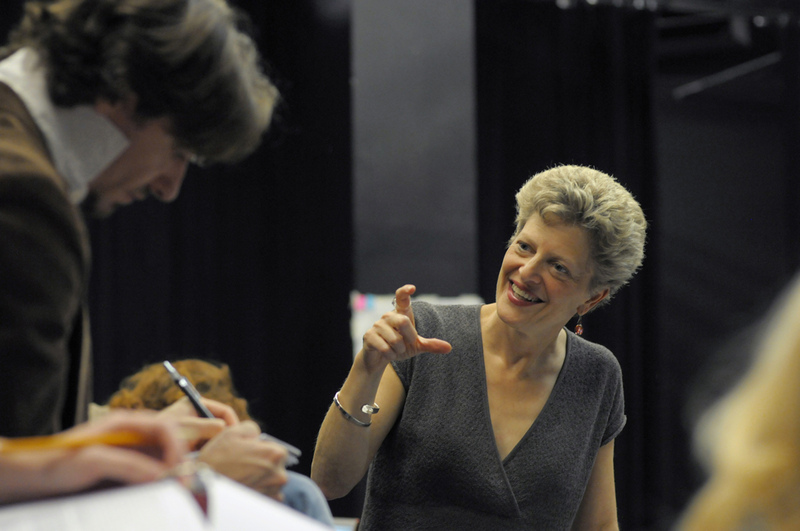 Carey Perloff in the rehearsal room. Photo by Kevin Berne. Carey: That took me a long time to even get to. And then watching his Taming of the Shrew, and reading a lot of those books and talking to a lot of people from the early days of ACT... Funnily enough, it changed my thinking about the field and certainly increased my incredible respect for his courage and what he’d done. When did you found Woolly? Howard: Our official founding in DC was in 1980, but our founding manifesto, which we wrote in New York before we moved to DC, was in ’78. Literally forty years ago. That had a little bit to do with my decision to leave. Carey: It feels to me like one of the things that’s happened—both a good thing and a bad thing—is a codification and institutionalization of the theatre. There are protocols and fundraising and subscriptions and seasons, but in all of that, that anarchic, amazing, idiosyncratic founding impulse has been forgotten. One of the things I really worry about with the theatre is that every theatre is sort of pursuing the same thing, doing the same five plays, and commissioning the same writers. I think it’s healthy and fascinating to go back. I read all of Todd London’s amazing An Ideal Theater. Did you look at those manifestos? Howard: Oh yeah. I’ve read a lot of them. Carey: Just incredible, and also very inspiring. Howard: I was lucky because Zelda Fichandler spent the last several years of her life in Washington, DC after she retired from NYU. We got together several times, and I interviewed her about her early days at Arena. With Woolly, when we started out, we thought, “We’re the anti-regional theatre. We’re trying to do something that’s completely different from the more mainstream companies.” But as I got to know Zelda better later in her life, it was clear that that founding impulse of Arena was the same, that she thought of herself in every way as much of a radical and as much of a rabble-rouser and as much of an on-the-front-lines person as I ever did about myself. I was struck by how common that impulse was, and that it’s a radical impulse. Carey: She was my first prototype of an artistic director, because I grew up in DC. You thought Woolly was the anti-regional theatre, and she thought Arena was the anti-commercial theatre, right? Carey: She gave that incredible speech before Congress in 1968 to fight for the 501c3 nonprofit tax status to be applied to non-commercial theatre. At the beginning of every year at ACT when I taught the students, that was the first thing I always read them. Doing classical theatre alongside new plays and making work for the Washington community—not trying to make work that was going to transfer to New York and please somebody else—those founding principles, that’s what I believe in. And one of the reasons I thought, “Well, it’s probably time for me to go,” is that it’s a hard fight to keep up in the nonprofit theatre in America. I don’t know that it’s a fight we’re going to win. I think the commercial theatre is going to win. Howard: The so-called institution has its own weight. Carey: By now in the nonprofit theatre, we really value very little that isn’t connected in some way to what is going to have a life in New York. That’s basically our barometer. Howard: From Woolly’s perspective as a much smaller organization, I don’t feel that quite as strongly, but we have our own version of that. It has to do with balancing the passion projects we know are pushing the envelope and stretching our audiences in a way that is core to our mission, and projects that have that pedigree that came from New York or something like that. We found a way that everything can fit within the constellation—Woolly’s mission is pretty tight. Carey: It feels like your aesthetic is really specific in an amazing way. Do you feel like that changed over the course of time or that it became clearer to you overtime, the kind of work you were really seeking? Carey: Were you the one who had to go back into that well? Did you have people surrounding you who were part of that original inspiration? Howard: We started as three cofounders at Woolly Mammoth. Then, within seven years, I was the only one continuing. I’ve gone on forty years, but I would say that it’s never ever been just me. It’s always been a dialogue, some intense conversation between me and somebody, sometimes with whole groups of people. After my cofounders left, I’d always have an associate artistic director or a resident director or a dramaturg. I always needed that person who would mix it up with me and who would fight me. That’s the way I like to work. I like to have people around me who are going to challenge me. That’s when you really feel things move forward. Why did you stay as long as you did at ACT, and why did you leave when you did? Carey: Hilariously, my first year was so tempestuous, I always say I didn’t think I would last twenty-five minutes, let alone twenty-five years. I was a downtown, off-of-Broadway, very young female director. I didn’t have any peers in the regional theatre or any model to follow, and ACT was absolutely bankrupt. The Geary Theater lay in ruins from the earthquake. The school was in huge trouble. There was no money, no infrastructure. Even though it was a twenty-five-year-old theatre, it was as if I’d come to a total startup. That rebuilding helped me imagine what ACT could be, and that was a five- to six-year process. It was huge. Then it was another five to six years in which we had to really get used to being back at the Geary, and I had to learn to be completely honest, how to direct and program in a space like that. It wasn’t what I knew. I didn’t come from big proscenium theatre. That was a fascinating and amazing learning curve for me. 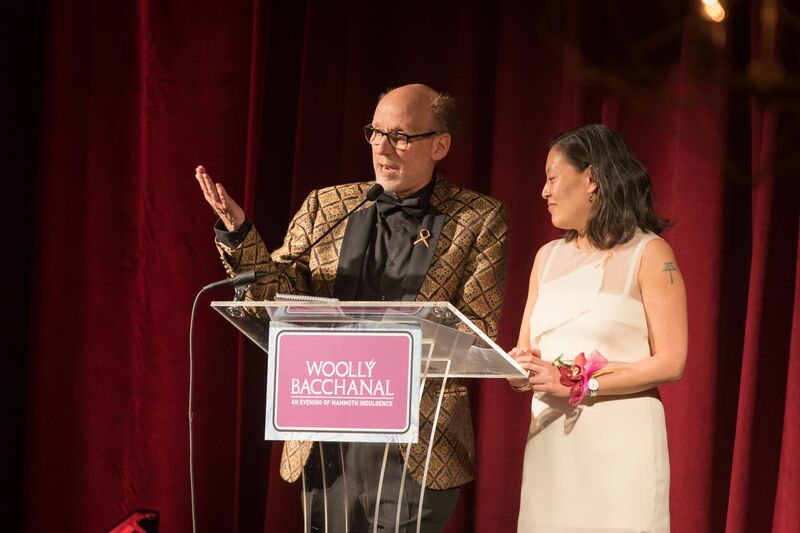 Howard and Linette S. Hwu, the President of Woolly's Board of Directors. Photo by David Claypool. That’s exactly what happened for me at Woolly. I started the theatre when I was in my mid twenties with a couple friends. It’s all euphoria—everybody pitching in, working twenty hours, all-nighters, all of that stuff—for the first five years in what was, for us, a sort of incubator home. Then it’s like, “Well, okay. If this is really working, how do we actually give this a little bit of permanence. And then we landed in a home that kept us going for quite a period of time, another thirteen years. At that point, we were approaching our thirtieth anniversary, and we did a huge amount of soul searching about what we stand for. And we reinvented it all again under this banner of connectivity. Anybody from the outside goes, “Oh my God. How could you do that for twenty-five years or forty years?” It was really just a series of cycles. I’m curious about your experiences around the transition. Was it good for you? Was it a good process? Carey: I think people forget how lonely it is to be an artistic director. Your job is to nurture everybody else, to guide their work, to give the best notes you can. But for myself, I thought, “If I don’t dare now to just face the unknown, I’ll never do it.” I looked at my colleagues and thought, “They’re much braver than I am.” I’ve had lots of friends who’ve reinvented their lives many times, and my husband has reinvented his life many times, and I thought, “It takes courage to run a theatre, but, also, it takes courage to leave. I want to see if I have that courage to actually face an empty day.” I’ve never had that, seriously, since I was twenty-seven, and you haven’t either. Howard: No, I have not either. Carey: When I told my children I was leaving ACT, my daughter said to me, “But where will you go in the morning? I’ve only ever known you as the artistic director of ACT.” And I remember saying to her, “Well darling, I hope you love me anyway.” And the weird thing is how much joy I found in not having anywhere to go in the morning, which I didn’t expect. Howard: That’s good to hear. Carey: Every day is sort of, “How am I going to make my day?” I’m moved by that. But who knows? In six months, I might be in total despair thinking I’d better go run something else. Howard: Our jobs are also a big part of our social life. Carey: It’s true, and also you’re such a natural leader. When I told Antoni Cimolino at the Stratford Festival that I was leaving, he thought I was crazy and said to me, “Well, there are not many natural leaders in the world and you’re one and you should lead.” And I thought, well aren’t there many ways to lead? The times I’ve recently been at Woolly—that I’ve seen the space or come to see Robert O’Hara’s plays—I haven’t actually seen you there, but I’ve seen your work. And your presence was incredibly palpable. But I will also say your presence in this field is palpable and I’m excited to see you lead in this moment, by talking about a lot of these things that are on your mind, things that you—even as a risk taker at Woolly, and God knows you have been—weren’t able to say there because you were responsible to a whole institution. But now you’re only responsible to your own vision. To be able to stand up for things and be provocative, I think it’s going to be incredibly important. That’s a role we should be playing. I’m excited to hear what you have to say.